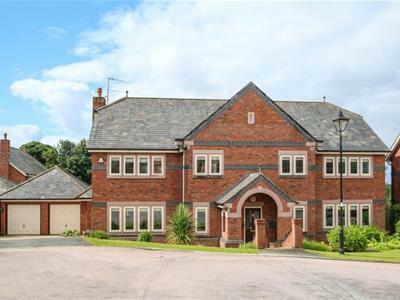 IMPRESSIVE Detached RESIDENCE - VIEWS over FIRS LANE - APPLETONS Premier LOCATION - SECLUDED PRIVATE Gardens - Over 3300sqft of IMMACULATE accommodation. Located on the 'HAMPTONS' this stunning Detached home is superbly appointed throughout and benefits from flexible living accommodation including a beautiful welcoming entrance hallway, lounge, dining room, breakfast kitchen with open plan family room and garden room, study and cloakroom with Wc. 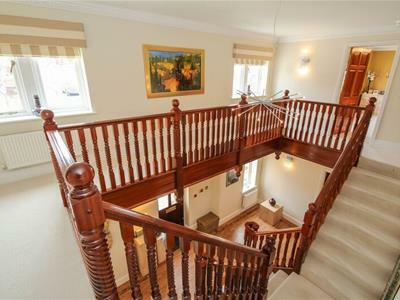 Galleried landing, master suite with dressing room and an en-suite bathroom, four further bedrooms, three shower rooms. 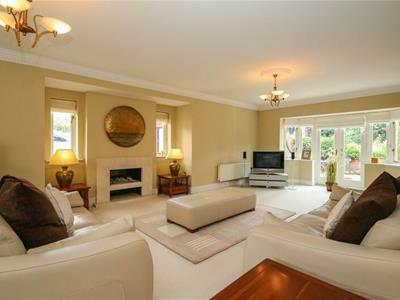 Externally there is a double detached garage, private gardens which are not overlooked. 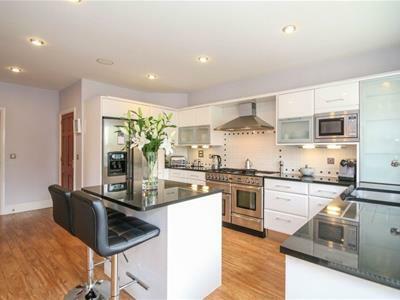 Occupying a highly sought after location on this well established development made up of similar properties, this stunning detached residence offers superbly appointed accommodation which has been finished to a high specification and is beautifully presented throughout. To the ground floor there is a welcoming entrance hallway with stunning central staircase which in turn leads through into a beautiful lounge with feature fireplace, separate room which would be ideal for formal dining purposes, stylishly fitted breakfast kitchen complete with a range of matching eye and base level units, complimented by integrated appliances and granite work surfaces, utility room again with a range of eye and base level units, delightful family room with Amtico flooring and a stunning garden room with pitched ceiling and views overlooking the garden. There is a useful study room and a cloakroom with Wc to the ground floor for convenience purposes. To the first floor the accommodation is accessed by a wonderful galleried landing which in turn leads through to a stunning master bedroom, complete with its own dressing room and en-suite facility with luxurious suite, second guest bedrooms again with its own modern en-suite facility, a further bedroom with en-suite facility and two additional double bedrooms. There is a further shower room with modern white suite and chrome fittings. The majority of the bedrooms are fitted with a varying range of stunning furniture, and a sound system is fitted throughout the house. 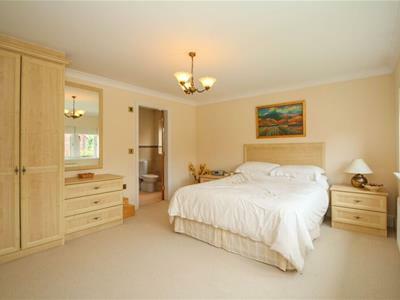 This superbly appointed accommodation is warmed by central heating which is complimented by double glazing. An internal inspection is highly recommended at the earliest opportunity. 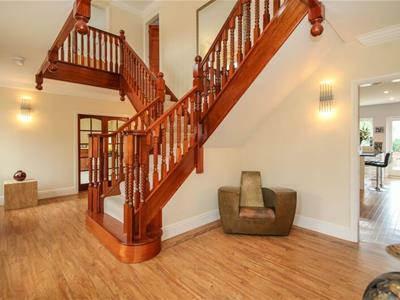 Amtico flooring, central staircase, ceiling coving, two central heating radiators, panelled and leaded front door, four wall light points and under stairs cupboard. Dual aspect with double glazed windows to the front and rear elevations, French doors opening onto the patio area, contemporary design marble fireplace and hearth, ceiling coving, two ceiling roses, two further windows to the side elevation, two central heating radiators, television point, double glazed French doors into the hallway. ceiling coving, ceiling rose, built in sound system, central heating radiator, double glazed window to the front elevation, double glazed door to the hallway. A range of matching eye and base level units with concealed lighting, glazed display cabinets, integrated microwave, Bosch dishwasher, Range cooker, American fridge and freezer, complimentary tiling, sink and drainer, set in granite work surfaces, central island with breakfast bar, spotlights, sound system, built in pantry cupboard, Amtico flooring, French doors to the rear patio. A range of matching eye and base level units, chrome sink and drainer unit, set in heat resistant roll edge work surfaces, plumbing for a washing machine, tumble dryer, additional fridge space, wall mounted boiler, Amtico flooring, part glazed door to the side elevation and a central heating radiator. Amtico flooring, ceiling coving, built in sound system and a television point. 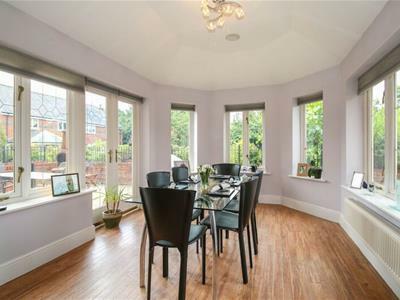 double glazed leaded windows overlooking the garden, central heating radiator, pitched roof with built in sound system, French doors onto the patio area and Amtico flooring. Built in desk with drawers, additional shelving, ceiling coving, central heating radiator and a double glazed window to the rear elevation. White Royal Doulton suite including a pedestal wash hand basin with mixer tap, low level Wc, Amtico flooring, part tiled walls, central heating radiator, extractor fan and built in shelves. 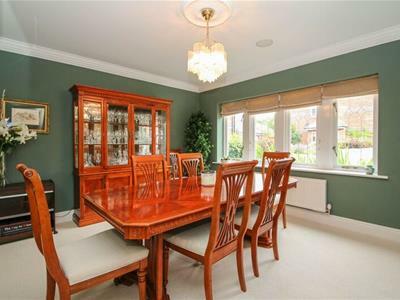 galleried landing, ceiling coving, ceiling rose, double glazed leaded windows to the front elevation, two central heating radiators. Built in furniture including a corner dressing table and drawers with mirror, ceiling coving, built in sound system, double glazed leaded windows to the front elevation and a central heating radiator. Full height built in wardrobes incorporating three double wardrobes, two single wardrobes with hanging and shelving space, central heating radiator, double glazed window to the side elevation. Comprising of a white four piece suite including a Jacuzzi bath, double shower cubicle with Jets, large shower head and a additional shower attachment. 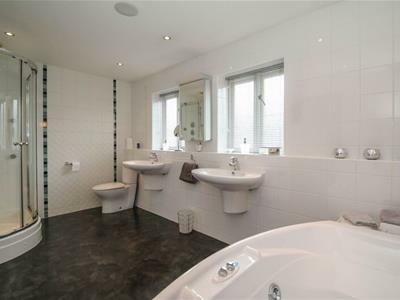 twin wall mounted wash hand basins, low level Wc, fully tiled walls, contemporary style central heating radiator, Amtico flooring, spotlights, sound system, two double glazed windows to the rear elevation and two wall lights. 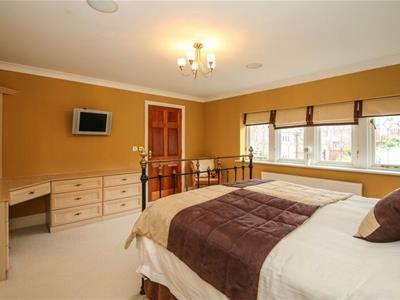 Built in wardrobes, drawers, ceiling coving, central heating radiator and double glazed window to the front elevation. White Royal Doulton suite incorporating a corner shower cubicle, pedestal wash hand basin, low level Wc, shavers point, half tiled walls, spotlights, chrome ladder style central heating radiator, double glazed window to the side elevation and extractor. Built in double wardrobes, desk, double glazed windows to the rear elevation, central heating radiator, ceiling coving and sound system. Three piece suite comprising of a corner shower, pedestal wash hand basin, low level Wc, wall mounted mirror, fully tiled walls, chrome central heating radiator. Built in full length wardrobes, sound system, central heating radiator, double glazed window to the rear elevation. 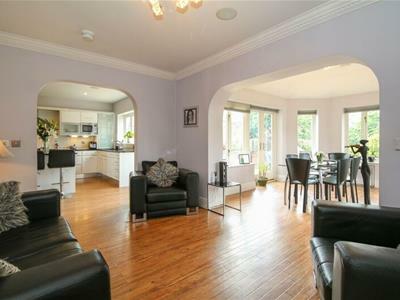 Amtico flooring, central heating radiator, ceiling coving, double glazed windows to the rear elevation. Shower with multi function jets, pedestal wash hand basin, low level Wc, fully tiled walls, chrome central heating radiator, wall mounted mirror, spotlights and an extractor fan. Two electric double doors and a side courtesy door. 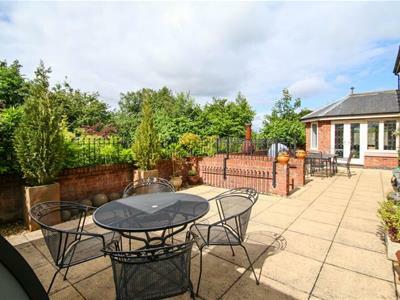 A large raised sun terrace patio with undisturbed south facing views, steps down onto a private decked area with hot tub and a additional timber garden room. Water feature and raised planted boarders. Gated access to the front and side, ample exterior lighting.